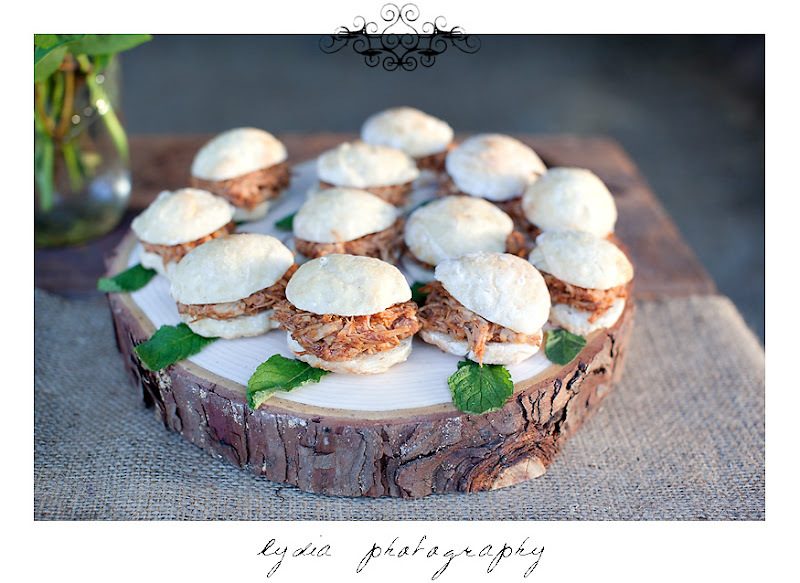 One of the keys to pulling off an awesome shoot, and a fabulous wedding, is great food! I wanted everything to look pretty but still have that rustic flair. And as I put it all together myself, I know you can easily do it too for your special day! To get the cute little rustic rolls for the mini pulled pork sandwiches, here are my directions adapted from this easy no knead bread recipe. Mix well to combine dry ingredients then mix in water. Cover bowl with plastic wrap and allow dough to rest in a warm place for at least 12 hours. To make mini rolls, flour hands then pull off small amounts of dough and form into little balls. Place on flour-covered parchment paper. Place large Pyrex bowl in the oven and heat to 475 degrees. Once heated, place small balls of dough in bowl, cover bowl with Pyrex pie dish, and bake for 8 minutes. Take off the pie dish lid and bake for another 8 minutes. Remove from oven and cool on wire rack. Add a dab of butter or cut in half for mini pulled pork sandwiches and enjoy!